As a mother of two toddlers, I find I spend much of the year centering all of my decisions about food around my children. If we want to eat out as a family, I immediately begin to run through a list of diagnostic questions I routinely use to determine if what I am craving is in line with what works best for my two young kids. Will my toddlers be welcome here or will we be at the receiving end of stares from the moment we walk in the door? Does the restaurant throw a paper children’s menu and box of crayons on the table to keep my kids entertained? Will we have to wait for more than 15 minutes for our food or should I bring a ziploc of cheerios to keep my one-year-old happy? Are there macaroni and cheese or french fries on the menu? If not, is there a single item on the menu I can talk them into eating? Of course, I also have to consider that I have either been pregnant or breastfeeding for the vast majority of the last five years. This means I have a whole new list of criteria concerning undercooked foods, softs cheeses and alcohol to take into account. I’m not complaining; I am just telling the truth. If I want to eat out with my family, if I want to avoid a public meltdown or stares from the very nice, middle-aged couple who didn’t plan for songs from Daniel Tiger to be the soundtrack of their night out, then I have to choose the restaurant with my toddlers in mind. So, when I start to daydream about Mother’s day, or if my husband is poking around for inspiration for celebrating the day, I start to feel a little…selfish. I want to avoid any establishment that involves all-you-can eat pancakes topped with a butter substitute, canned whipped cream and waxy chocolate chips. I don’t want to sit at table with a tablecloth that doubles as a drawing canvas for my toddlers. And as much I enjoy a good slice of pizza or a bacon cheeseburger, I would prefer not to eat anything that is reminiscent of something I can pick up in a drive through. And let’s just face it, the stereotypical, family-friendly, Mother’s Day brunch of scrambled eggs that likely began as a powder in a plastic bag and lukewarm sausage gravy on hockey puck biscuits is basically the culinary equivalent of a box of knock-off Russel Stovers and a dozen roses. The thought is nice, but it really misses the mark. If this one day of the year is really all about me, I have a few ideas about what I would like to eat. What if this year, instead of spending Mother’s Day cutting up chicken fingers and serving up mac n’ cheese, we drop the kids off with Grandpa and you take me to try the new Scandinavian restaurant here in Kansas City, Krokstrom Klubb & Market I would love to start with roasted beet salad topped with lavender goat cheese and then eat my fill of a smorgasbord of smoked salmon, aged cheddar, pickled onions, and cured meats. Except, I’m pregnant again this year so just about everything at this restaurant is off limits. 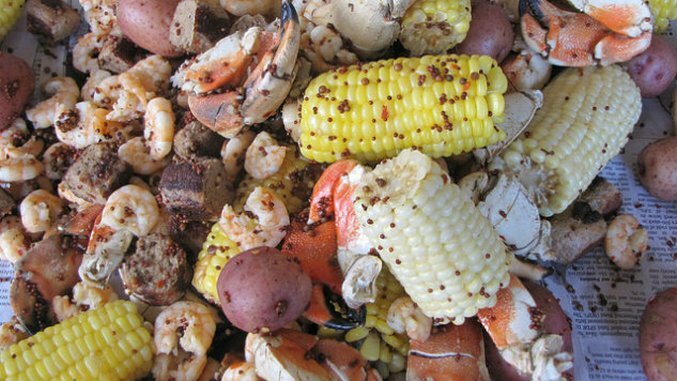 All right, we’ll skip Scandinavian charcuterie and opt for a lowcountry boil. Grab the napkins, roll out the butcher paper, and set a pot of shrimp, corn, and potatoes to boil. We don’t need to get a sitter or even leave the house for this meal. That is probably best since we live in the Midwest and our options for finding this meal are a direct flight to Charleston for dinner at Fleet Landing or a quick drive down the road to Red Lobster. No offense to Queen Bey, but cheddar biscuits just aren’t my thing. And, since seafood is the last thing you or our children like to eat, I fully anticipate eating this meal alone. In fact, you had better go ahead and pick up the necessary fixins’ for PB&J while you are shopping, as well. Maybe we had better just eat out. It is a lot to ask you to tackle a recipe you have never made before with kids underfoot. How about we hire a babysitter and you take me out for Korean barbecue? There is a newer place on the south side of Kansas City called ChoSun Korean BBQ. They have combo platters for two, consisting of a completely excessive amount of beef. We can start with Gun Man Du, meat-filled dumplings that are pan fried until crispy and then eat our fill of succulent bulgogi, grilled right in front of us, and pair it with kimchi spicy enough to send me into early labor. I know a babysitter and a dinner out might not be in the cards for us this year and I am a woman who is open to compromise. So, we could also track down my favorite food truck, Taco Republic, and eat street tacos off of paper plates in the park while our children run wild until dark. It’s the best of both worlds, really. Our children can have the freedom they desire, they can eat off the ground and come home covered in dirt, and I can celebrate not only surviving, but loving, another year of motherhood with beer braised brisket and pork belly wrapped in crispy, homemade corn tortillas. Sure, many mothers will insist they want to spend Mother’s Day with their families, that spending quality time with the people they love the most is the only thing that matters. Of course, that is part of it but we also want to feel appreciated, to hear the “thank yous” that have been neglected during the late nights, early mornings and everything in between. When it comes down to it, we don’t need a visit to the fanciest restaurant or to be given the most expensive gift. We need to know that celebrating our day was given time and thought, that Mother’s Day was planned with care. So, let’s skip brunch and try something different this year.